Mary Huffman's school spirit is alive and well - and she's got 42 years of working at Kirkwood Community College to prove it. There's no denying this vivacious Kirkwood fan. 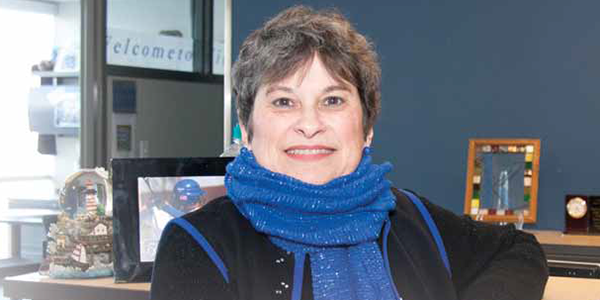 She bustles with enthusiasm for helping Kirkwood students, wearing the distinctive Kirkwood blue. Huffman's allegiance to Kirkwood goes back to its very beginnings, "when Kirkwood was a toddler," she says with a laugh. She was a general secretary studies student from 1968-69 and started full-time work in 1970 in personnel and licensing. At that time, community colleges were considered part of K-14 school systems, Huffman explains. Her bosses worked tirelessly to get Kirkwood recognized as a college, part of a viable community college system. "I got such an overwhelming education working with them," Huffman recalls. "I've worked with so many tremendous people who helped shape Kirkwood and helped me become the person I am. I really feel like they, along with my parents, have molded me." That experience shaped her attitude about making a difference through the Kirkwood Foundation. She began by giving 50 cents from each paycheck - $12 a year - toward a scholarship. Over the years, she increased her annual gift, supporting several scholarships. "If everybody gives a little bit, it builds up," she explains. "It really shows that no amount is too small to make a difference." Huffman retired from fulltime work in 2006 after 36 years - in administration, business and athletics departments. She's worked part-time since 2007, musing that "working with the students here has kept me young." During Kirkwood's 2006 campaign, Huffman decided to contribute her banked vacation pay for something new. "I thought, 'this is my chance. I put in all these years here and I want to give more and have my name on it. I want to leave my footprint somehow," says Huffman. She has cemented her footprint by establishing the Mary Huffman Endowed Scholarship for students in Kirkwood's Learning Services programs that help those with disabilities. "That program holds a very special place in my heart," Huffman notes, because she saw how it helped her nieces. "Kirkwood hasn't only touched my life through me, but through my family." Today she is part-time office coordinator for Kirkwood's Student Life office. She loves it. And she still doesn't want to retire. "I can't imagine not coming here to work," says Huffman. "This has been my heart and soul for 42 years."